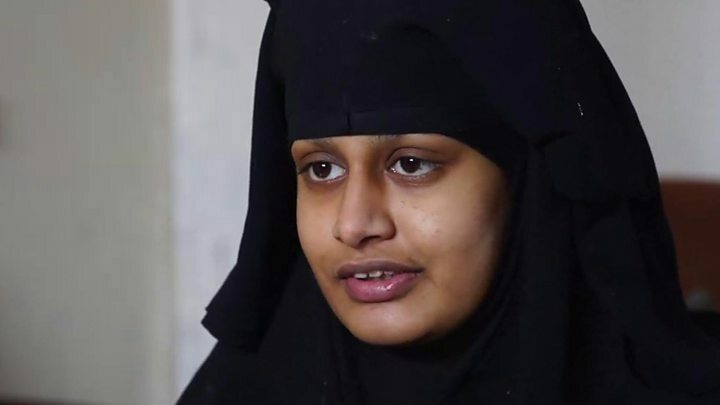 Shamima Begum – the schoolgirl who fled London to join the Islamic State group in Syria – has said she never wanted to be an IS “poster girl”. Ms Begum, who has just given birth, said she now wants the UK’s forgiveness and supports “some British values”. She told the BBC while it was “wrong” innocent people died in the 2017 Manchester attack, it was “kind of retaliation” for attacks on IS. The 19-year-old left Bethnal Green four years ago with two school friends. There has been debate about Ms Begum’s plight since she was found in a Syrian refugee camp by the Times newspaper last week after reportedly leaving Baghuz, IS’s last stronghold in the country. She gave birth to a baby boy last weekend, having previously lost two children, and named him after her first son. While she told the BBC she would have let her late son become an IS fighter, she wants her new baby “to be British” and for her to return to the UK with him. 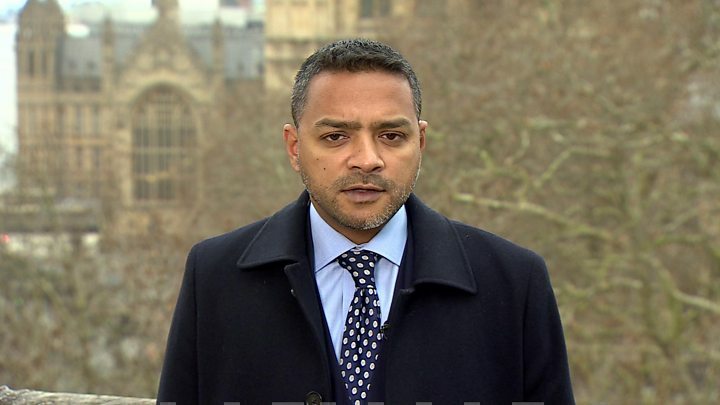 In an interview with the BBC’s Middle East correspondent Quentin Sommerville on Monday, Ms Begum said: “I don’t actually agree with everything they’ve done. Home Secretary Sajid Javid told MPs on Monday that he would not “hesitate to prevent” the return of Britons who travelled to Syria to join IS. While the UK cannot leave people stateless, under international law, he said any such Britons would be “questioned, investigated and potentially prosecuted”. No British troops would be used to help or rescue them, he said. He told MPs that more than 100 dual nationals have already lost their UK citizenship after travelling in support of terrorist groups. “If you back terror, there must be consequences,” he said. More than 900 people have left the UK to join the conflict in Syria, said Mr Javid, adding that those who join IS have “shown they hate our country and the values that we stand for”. She compared the attack to military assaults on Syria, saying: “It’s one thing to kill a soldier, it’s fine, it’s self-defence. But to kill people like women and children just like the women and children in Baghuz who are being killed right now unjustly by the bombings – it’s a two-way thing really because women and children are being killed back in the Islamic State right now. Ms Begum said she was sorry for all the families who had lost people because of the attacks in the UK and other countries. Ms Begum said she made the choice to go to Syria and could make her own decisions, despite being only 15 at the time. She said she was partly inspired by videos of fighters beheading hostages and also by videos showing “the good life” under IS. She watched videos of the murders of British hostages, she told the BBC, but said she did not know the names of any of the victims. But she said: “I just want forgiveness really, from the UK. Everything I’ve been through, I didn’t expect I would go through that. Twelve more British women have arrived at the camp in Syria in the last week and more are expected, our correspondent added. Media captionTasnime Akunjee, the lawyer for the family of Shamima Begum, expects her to be “damaged” by her ordeal. Earlier, the lawyer representing Ms Begum’s family said she is “damaged” and will need mental health support. Tasnime Akunjee also said her family are prepared to raise her newborn baby away from “IS thinking”. He said Ms Begum – who is legally British – had still not been in contact with her family and the family are trying to get the government to provide travel documents for Ms Begum and her newborn son, who he said has a right to citizenship. Ms Begum left the UK in February 2015 with two other schoolgirls, Kadiza Sultana and Amira Abase. Kadiza is thought to have died when a house was blown up, and the fate of Amira is unknown. Mr Akunjee also called for an “urgent inquiry” into how Ms Begum and the other schoolgirls were able to travel to Syria. Previously, Ms Begum said she escaped from Baghuz, Islamic State’s last stronghold in eastern Syria, two weeks ago. Under international law, the UK is obliged to let a Briton without the claim to another nationality return home.